home Hardware Should you buy a SSD for your Mac? SSDs, short for “Solid State Drives”, were only a few years ago out of the price range of consumers and their personal computers – Being used primarily by business users and computer enthusiasts. In 2013, however, SSDs are becoming increasingly affordable, and are a viable option for storage on personal computers – In particular, laptops, as they are sensitive to power consumption and physical wear & tear. This article will explain to you the pros and cons of installing a SSD in your Mac, and ultimately wether it’s worth the money. For those of you who are just looking for our top product recommendations, see the table below. If you’re interested in reading about the benefits and comparisons of an SSD, jump below for our in-depth article. So, which Macs can a SSD be installed in? It’s an important thing to know, as there’s no point in reading this article and learning all about SSDs if you can’t even install one in your Mac – Or if your Mac already has a SSD built in, but you don’t know it! Basically, any Mac that has a user-replaceable hard disk can have a 3rd party SSD installed in it – These include the Classic MacBook Pro, the white Polycarbon MacBook, the Mac Mini and the iMac. Therefore, if you own one of them, this article is for you. And as for the Retina MacBook Pro and the MacBook Air: If you already don’t, you’ll be pleased to know that they already have SSDs pre-installed; standard. Cost is quite possibly the biggest factor you’ll have to weigh up when deciding wether to buy a SSD for your Mac or not (and if so, which one). A few years ago, SSDs that were little over 100GB in size cost the better part of a grand in price – Nowadays, however, 128GB SSDs barely cost more than their 128GB HDD (mechanical hard disk) counterparts. It’s only when you get up to 256GB and beyond that the SSD pricing begins to pull up & away from HDD pricing. 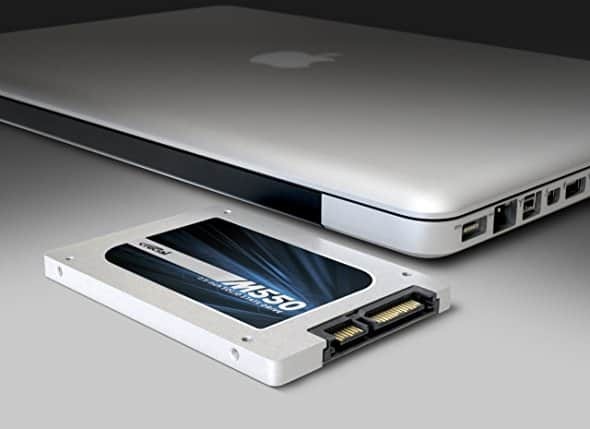 Therefore, the less space you use, the more economical and practical it is for you to get a SSD for your Mac. Don’t know how much space you’ll be needing? Then read on, and we’ll find out how much you’ll most likely need! One good indicator of how much hard drive space you’ll need is how full your current hard drive is. Finding this out is relatively easy – Simply download iStat Pro freely from MacUpdate here. Once it is installed on your Mac’s dashboard, have at the “disks” section of the widget. Unless you have more than one hard drive installed in your Mac, or have a disk, external drive or memory stick plugged in, a single drive should be displayed. Beneath the name of the drive there will be a two numbers – One marked “U” (for “used”) and one marked “F” (for “free”. Ignore, the “F” digits, and check out the “U” ones. This is how full your hard disk is. Once you’ve noted it down, read on to the next section, to see what sized SSD you’d be looking at if you decide to buy one. There are four standard sizes of Solid State Drives: 64GB, 128GB, 256GB & 512GB – Although the 64GB size is pretty irrelevant these days, due to it’s small size and the fact that it only costs $20-$30 more to get a 128GB one, which is double the size. So in this article we’ll just look at the latter three models. When thinking about which SSD size to get, you should look at the amount of space you’re currently using on your current hard disk and round it up a bit – Maybe 30-50GB, as it’s good to have a bit of extra space on your SSD, in case you need it later on. Not to mention the fact that a full or almost-full drive will preform more slowly that one with plenty of free space. So, if you’ve got 70GB used up, for example, the 128GB SSD model would be a good choice. If you had 120GB used up, the 256GB model would be the best choice. Or if you had 300GB used up, the 512GB model would be the best option. In the United States & Canada, a 128GB SSD costs around $120 US, a 256GB $190 and a 512GB $380. From this you can decide wether or not getting a SSD is worth the money, after you have read about the advantages in the rest of this article. For example, if you only need a 128GB drive, you might think getting a SSD is worthwhile, however if you need a 512GB drive you might decide that getting a SSD is too expensive. The primary reason people buy SSDs is because of the speed. Unlike HDDs, which use a spinning platter much like a DVD to store data, SSDs use electronic circuits to achieve the same goal. SSDs most closely resemble USB thumb drives and SD cards, in the way that they use electronic circuits with no moving parts to store data. SSDs are, however, much faster than USB sticks, as they use higher quality components and aren’t slowed down by the sluggish USB interface. So, exactly how much faster are SSDs than traditional hard drives with spinning platters? Depending on the speed that the platter spins at, traditional hard disk drives usually have a write speed of anywhere between 50 and 120MB/s. High quality SSDs, on the other hand, are almost always above 200MB/s, and the best ones can exceed 500MB/s. This means that you can expect the average SSD to be roughly double as fast when writing data as the average HDD, and in some cases more. But when will you notice this speed increase, while using your Mac? Having no moving parts, SSDs are very durable – Much more durable than regular, mechanical hard drives. This won’t be a huge advantage if you use a desktop Mac, such as an iMac or Mac Mini. However it’s a significant advantage in the case of MacBooks, as you’d no longer have to worry about your Mac’s hard drive being damaged if you drop the computer or subject it to sudden movements. Traditional HDDs are quite sensitive to shock damage, as the head (the arm that reads the platter) can go off-course and scratch the platter, resulting in corruption of the data stored on it. SSDs, however, can be bashed around quite a lot without getting damaged – One of the reasons that they have been used in portable devices like cameras for so long. Due to the fact that SSDs have absolutely no moving parts, they’re dead silent. This makes your Mac quieter in general, especially when preforming hard drive intensive tasks, such as copying large files. And while you might not appreciate the silence of a SSD over a traditional HDD during everyday use, you will if you ever do things like leave your Mac on overnight to download a large file, or to do some other task – Your Mac will be 100% silent unless the fans spin up. You also may find, if you happen to own a MacBook, that the computer won’t vibrate as much, due to the fact that most of the vibration of the case would have been caused by the mechanical hard drive’s platter spinning. Yet another secondary advantage of SSDs having no moving parts is the fact that they don’t use up as much power. And while this doesn’t matter much when it comes to desktop Macs, it’s a note-worthy advantage when it comes to MacBooks (which SSDs are more commonly found in). The interesting thing is that SSDs neither read nor write data more energy-efficiently than HDDs – So how do they manage to be more energy-efficient overall? Whilst SSDs don’t read/write more efficiently than HDDs, they do preform the tasks faster. This means that the SSD will finish the task earlier than the HDD, and thus have more idle time – Being idle consuming less power than reading or writing data. However this advantage doesn’t always show up in benchmark tests, as during the course of most power efficiency tests both the drives would be reading or writing data constantly for a set period of time. In the real world though, the SSD will always read or write for shorter periods, due to the fact that it is significantly faster. And therefore the Solid State Drive is more energy efficient than the mechanical Hard Disk Drive.